This is not a car you will see every day. It’s extremely rare, and only 150 cars were made. It is a Lamborghini Diablo Jota Edition 30. This absolutely brutal Lamborghini, designed by maestro Marcello Gandini had amazing performance and design. Especially in this dark purple paintwork. It still stunning, and a technical achievement for Automobili Lamborghini. It’s a large car, 4,5 meters in length and very wide. But it is not as heavy as you might think, it actually only weighs 1450 kilo. Compare this to the little Mercedes SLK that is 50 kilos heavier. The Lamborghini Diablo Jota packs a mighty punch from the fantastic mid mounted 5,7 liter V12 engine. The power is immersive, 595 horsepower is waiting to be released when the driver stomps the gas pedal. It has torque to pull a train (well, 639 Nm to be exactly) and the full 595 horses sets free at 7300 rp/m. The sound is glorious, and when the car accelerated hard, I almost had trouble holding the camera steady. The sprint to 100 km/h takes just 3,9 seconds. That’s fast even today. In 1995 the Lamborghini Diablo Jota ED30 was ludicrously fast. Top speed is crazy, 340 km/h (211 mph/h) and 0-1000 m takes just 20,1 seconds. 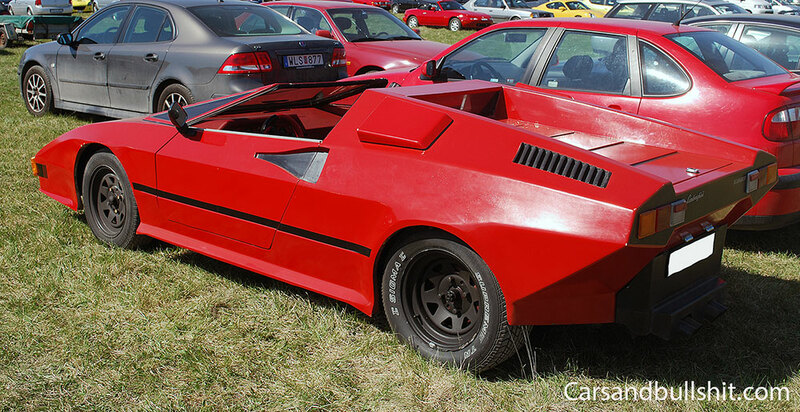 Behold the epic (probably one of a kind) Lamborghini Scarabeo kitcar based on a VolksWagen beetle. A great sportscar ready to take on the world with power design and performance. I wonder if it has the original beetle engine sporting 44 strong horsepower in the back. Remember, love these builds, don’t hate. You bet that this ”Lamborghini” Scarabeo got a lot of attention, you will get new friends every time you will take it for a ride.